The war for the Falkland Islands. (Bet you never expected to see that crop up on a site dedicated to popular music of the last 60 years. But we here at The Clock like to think of ourselves as The Spanish Inquisition of music blogs. Our chief weapon is surprise! Our two, two weapons are surprise and education! And an almost fanatical devotion to entertainment. Our three weapons are …. Okay, so maybe more Schoolhouse Rock than Spanish Inquisition. The conflict began in the spring of 1982 and lasted for just over two months, as England and Argentina took up arms over territorial rights to the tiny Falkland Islands group in the South Atlantic. Not expecting a military response, Argentina invaded the British colony in April only to surrender in June after receiving a definite retort of the military sort. You wouldn’t think a hit song would emerge from all this. Nor would you expect the singer of said hit song to be a 37 year-old paraplegic who earned his living making low-key experimental art rock. But the musical universe is infinite and you should always expect the unexpected. 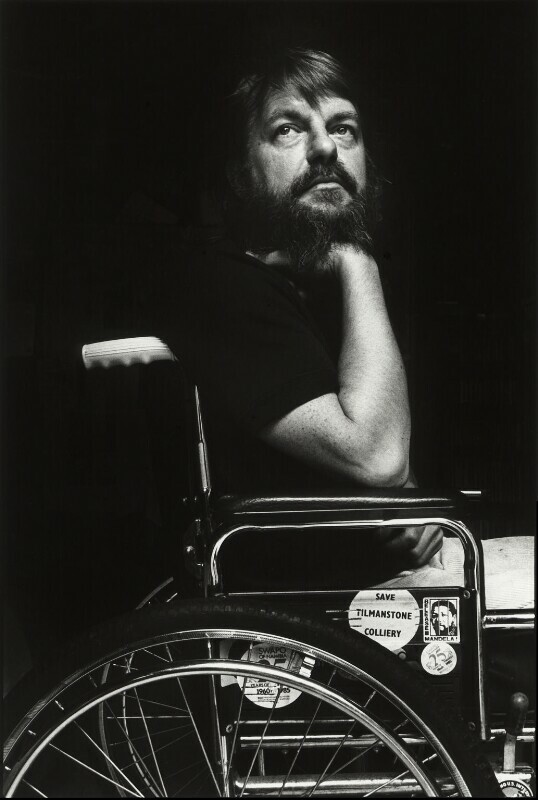 Robert Wyatt came to public attention in the late 1960’s as the drummer and co-vocalist for Soft Machine, a prog rock band known as part of the Canterbury scene. In 1973, a thoroughly wasted Wyatt fell out of a fourth-floor window, paralyzing him from the waist down. (He later said the accident likely saved his life. A serious alcoholic at the time, he assumed he would have died sooner rather than later had he continued his boozy, hard-partying lifestyle). He had to give up his rock drumming but continued with a jazzier style and began making solo albums of weird and warped prog, pop, and jazz. 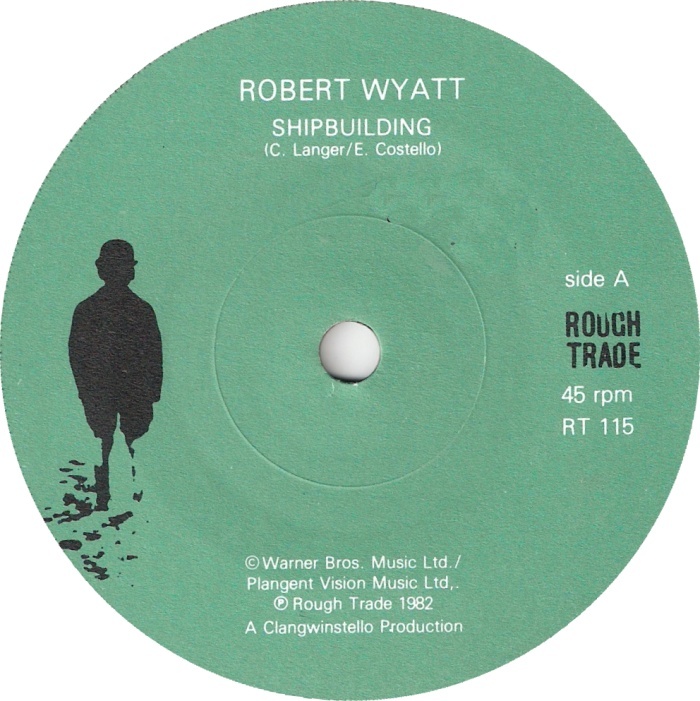 In 1982, Wyatt was sent a demo recording of a song entitled “Shipbuilding.” Producer Clive Langer wrote the song with Wyatt in mind but didn’t like the lyrics he’d composed. Luckily, he happened to know Elvis Costello, one of the finest lyricists in the UK, and Costello responded with a haunting story of a parent torn between gainful employment building destroyers (if the hostilities escalate and the shipyards open again), and losing his son to the war, possibly for a few months, possibly forever. Released as a single in August of 1982, “Shipbuilding” eventually reached the UK Top 40. Wyatt never charted again, simply returning to his own unique musical stylings. So keep your ear to the ground (as the rumors spread around town). And dive for pearls … with Robert Wyatt.